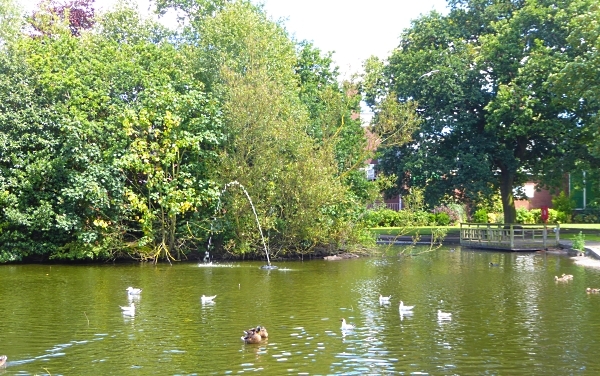 There are more parks or wildlife areas in Ormskirk than we thought! If you turn left from the station doorway towards the car park, there’s an area called Station Approach, a 7 acre mixed woodland and wildflower meadow on the site the old sidings and branch line to Skelmersdale. 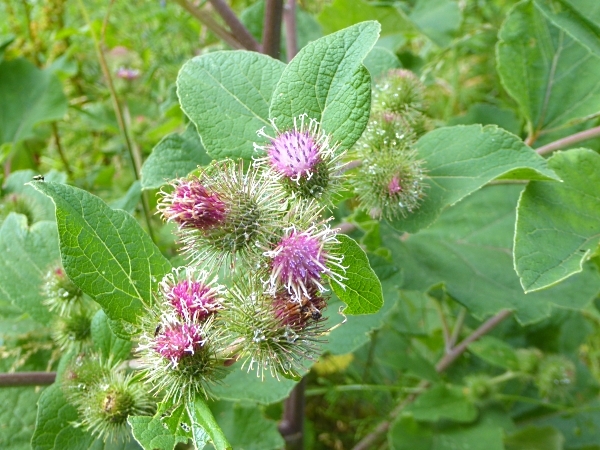 We did well for flowers there, noting Spear Thistle, Ragwort, Viper’s Bugloss, Foxglove, Great Willowherb and Lesser Burdock. After the sun came out there were lots of butterflies foraging for nectar, too. 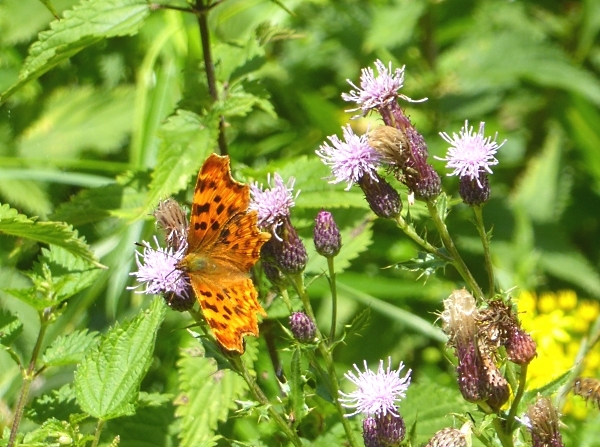 Large White, Meadow Brown, Gatekeeper, Green-veined White, Brimstone and this Comma on Creeping Thistle. There were Cinnabar Moth caterpillars on some of the Ragwort flowers, but they haven’t yet risen to the huge numbers we saw a few years ago. 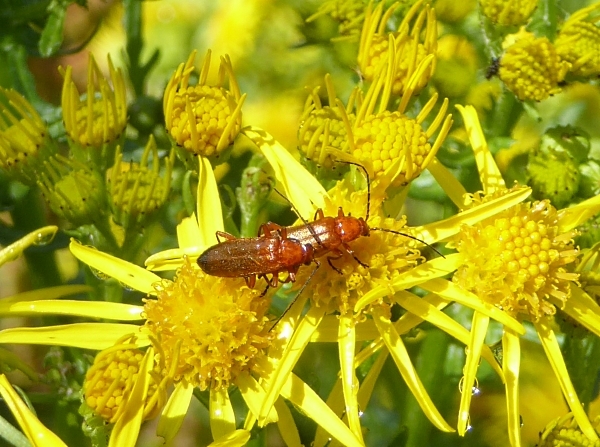 There was also a mating pair of Common Red Soldier Beetles Rhagonycha fulva. Wikipedia tells me they are so often seen coupling on white umbellifers that their common British epithet is “Hogweed Bonking Beetle”. We spotted a Song Thrush on the path and a Rabbit just disappearing as it heard us coming. Last night it rained, which had tempted out a huge variety of slugs onto the path, but they were heading back to the shade of the grass as swiftly as they could. 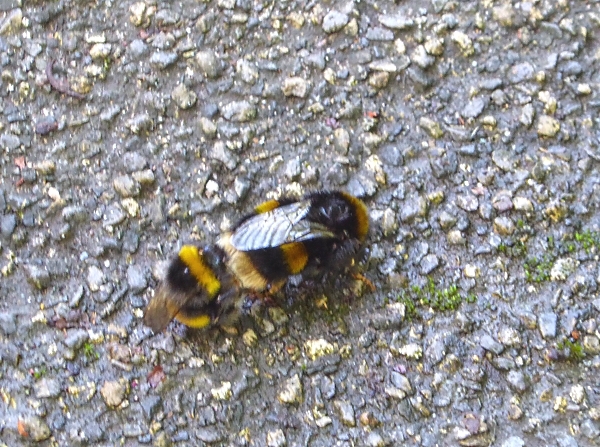 Talking of bonking, we stopped to look at what appeared to be a copulating pair of Buff-tailed Bumble Bees on a shady part of the path. The one at the front was still, but the one at the back, presumably the male, was pulsating. 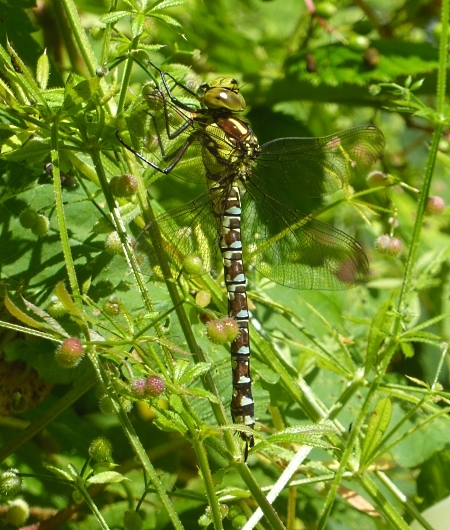 On a sunny corner a Common Hawker dragonfly was hanging vertically at head-height in the hedge, in amongst the Goose Grass. The path brought us back to the station, and then John led us to a tiny formal park in a triangle between St Helens Road and Ruff Lane, where we had our sandwiches. The flower beds were bright with cultivated blooms, but some of the gardeners had skimped their work, because the “weed” Gallant Soldier flourished amongst the showier Geranium blooms. 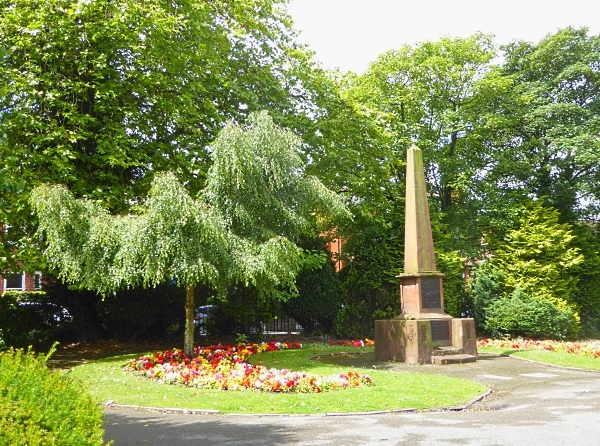 The little park seems to have been formed around an interesting pre-WWI War Memorial, because plaques on the obelisk named a local man who had participated in the Charge of the Light Brigade (but survived): “Sgt Major Nunnerley of the 17th Lancers, one of the Six Hundred” and also three men who had been killed in the Boer War. There was a young Weeping Birch next to it, which was appropriate. 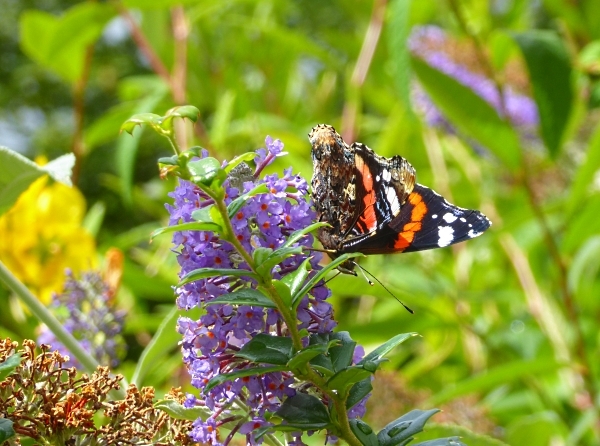 One large Marigold had a Gatekeeper butterfly, while a Buddleia had a single Red Admiral, the day’s seventh species. Then to Ormskirk’s principal park, Coronation Park. 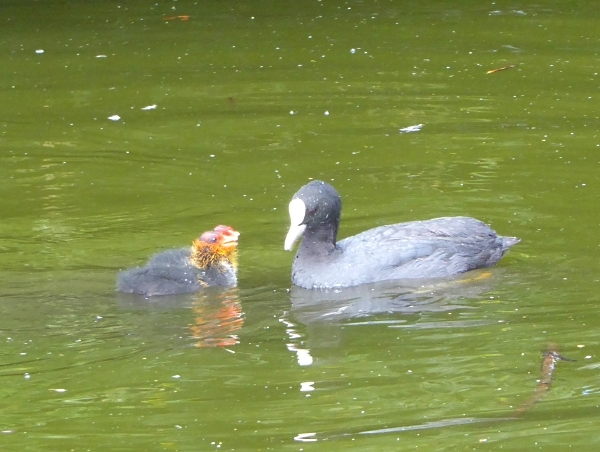 The lake was full of Black-headed Gulls, moulting Mallards, a surprising number of Moorhens and a pair of Coots feeding two ugly, baldy little chicks. Beyond the Lake they have a wildflower meadow. 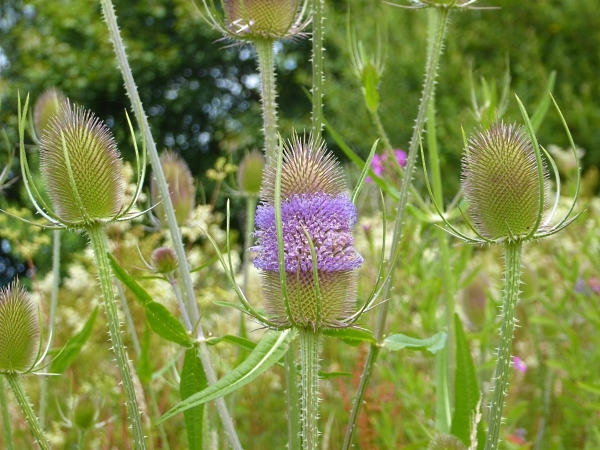 Most of it was Creeping Thistle and Great Willow Herb, but there was also Cornflower, Meadow Sweet starting to bloom and a Wild Teasel showing how it flowers, in a wave of development climbing up the head. Across County Road is the showroom of a company called Pangea Sculptures. 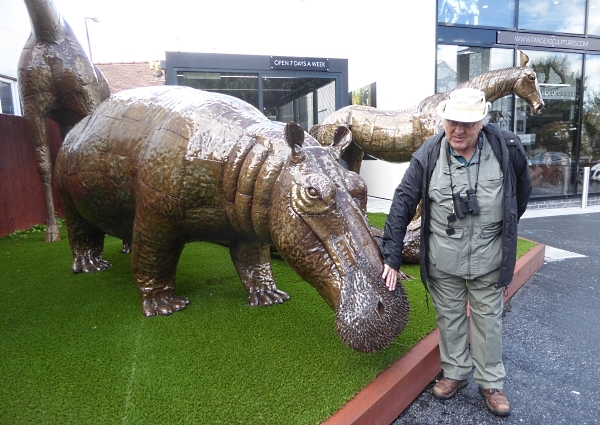 If you have ever wanted a life-sized metal elephant or hippopotamus on your estate (! ), this is the place to come. They cost a few thousand pounds, of course, but now we know where the huge Giraffe in the garden by Gorse Hill came from. I rather fancy a Cobra half-hidden in my shrubbery. 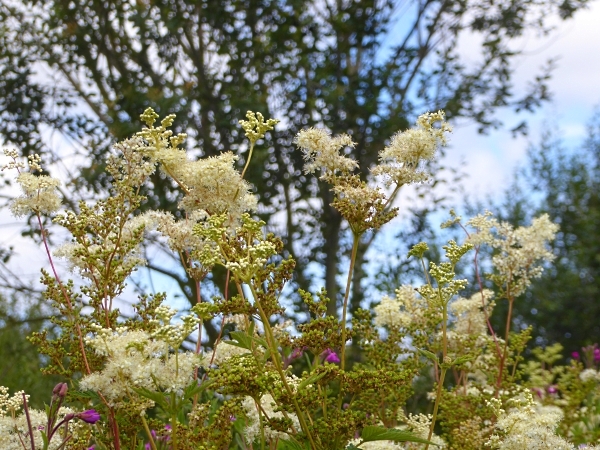 The Hurlston Brook runs through the park, north of the lake, and its banks had Hogweed and Himalayan Balsam. 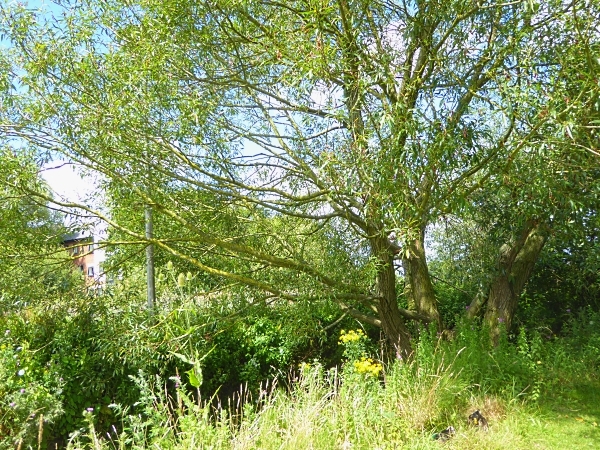 A big old Willow tree had branches leaning over towards the opposite bank, and we were pretty sure it was a Crack Willow. 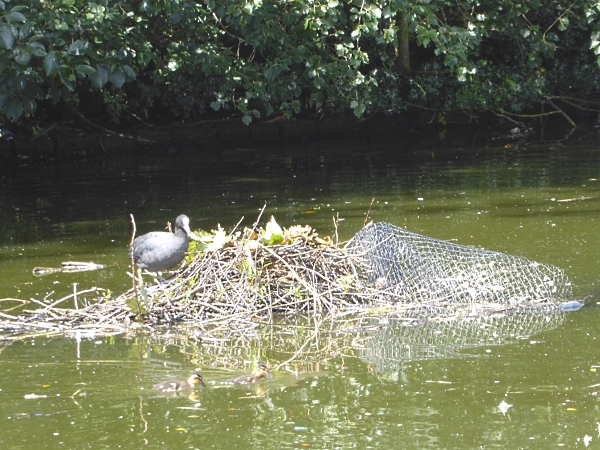 A Coot was busily refurbishing a nest on the lake. Is she going to have a second brood? It looked like it. 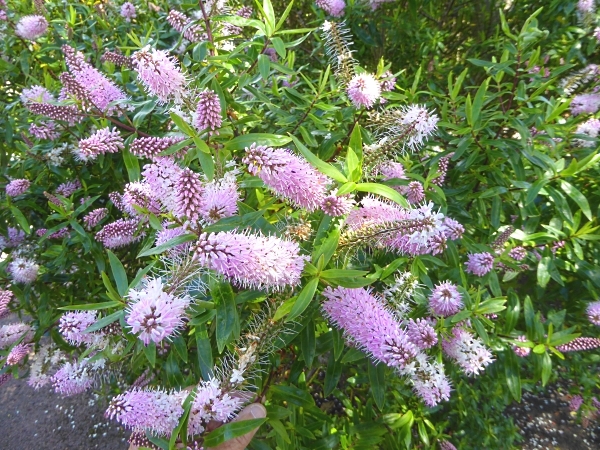 As we were leaving the park we stopped to admire this lovely flowering shrub, some kind of Hebe. Our tree points continue to mount up, now at 1135. The Crack Willow was worth 10, and we doubled the points from last week’s Spindle Tree by correctly answering the question “How does the Spindle tree get its name?” A: Its wood was used for making spindles for spinning fibres into yarn. We are scratching around for new birds, and we have been stuck on 1285 since 11th June. The only reasonably-likely additions to the list are Treecreeper, Bullfinch or Spotted Flycatcher, but we just haven’t come across them. We did well with wild flowers though, claiming six new ones today. Still climbing towards 1000 and now up to 865. Public transport details: Train from Central Station at 10.10 to Ormskirk, arriving 10.40. Returned on the 2.50 train, arriving Central at 3.20.